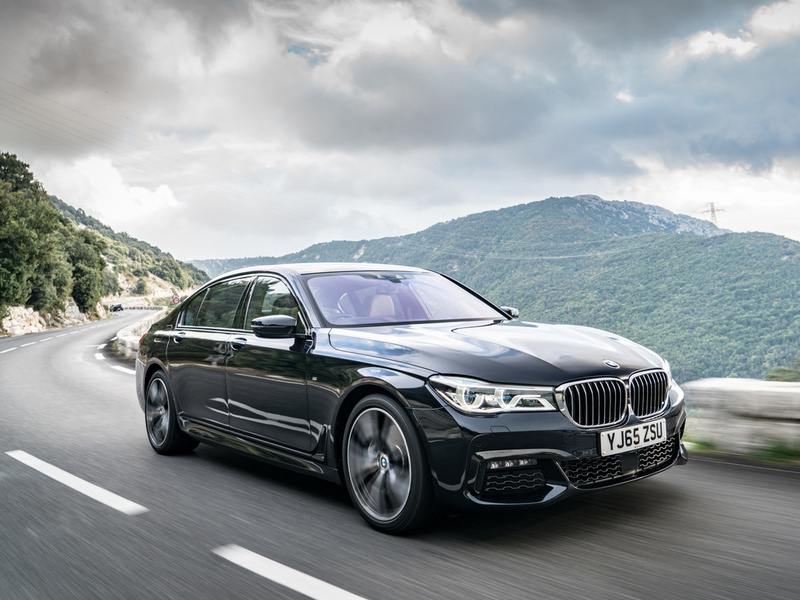 Chris Pickering drives the new BMW 7 Series and asks: Is it the cleverest car in the world? Well, to kick off, BMW's latest flagship is certainly packed with enough technology to shame a pretty credible spacecraft. The tech fest begins the moment you pick up the key, which has now morphed into something resembling a smartphone. This allows you to set the climate control settings and check things like fuel tank range via a 2.2-inch touchscreen display before you've even got in. From the middle of this year, it will even allow you to drive the 7 Series into or out of tight parking spaces remotely (although only once lined up straight). Inside it's like any other current BMW, but with the quality turned up to 11. Each car's interior is laser scanned as it goes down the production line, so the trim pieces can be individually machine cut to fit with sub-millimetric precision. There's a similar level of attention to detail in the materials, which are every bit as solid as you'd expect of our test car's £89,495 sticker price. Although the trusty iDrive controller remains, this is the first BMW to be fitted with a touchscreen display. It also comes with a surprisingly effective voice control mode. By far the best trick, however, is the optional gesture recognition system, which allows you to control various things, including the audio volume and the phone system, with a nonchalant wave of the hand. It's relatively limited in what it can do at the moment, but it's intuitive enough to use and worth the £160 premium for novelty value alone. Stretched 14 cm over the regular 7-Series, the long wheelbase model provides huge amounts of space front and rear. It now offers the longest wheelbase in its class, despite being somewhat shorter overall than the equivalent Mercedes S-Class. Later this year BMW will introduce its Executive Lounge Seating package, which will allow the front passenger seat to be slid forward by an extra 90 mm and its headrest folded flat. There's already a nifty feature that enables you to control the position of the front passenger seat from the row behind. Not that you really need to; even the lankiest executives should be able to stretch out without crushing their PA or whichever corporate underling occupies the seat in front. It's worth mentioning the seats themselves, which are quite possibly the comfiest we've ever sampled. Weird as it may sound, the rear headrests are a particular highlight, with a deliciously pillowy quality, capable of soothing away the worst the M25 has to offer. Each rear seat comes with its own 10.2-inch display, plus there's a removable 7-inch Android tablet stored in the centre armrest that can also be used outside of the vehicle. Between them, they allow passengers to surf the internet via the 7-Series' inbuilt WiFi hotspot, watch videos, control the stereo or adjust the climate control. There's even an exercise programme, linked to the standard-fit massage seats that measures how much pressure you're applying with a series of activities. The underlying structure is clever too, with a lightweight core made of carbon fibre, aluminium and high strength steel that shaves as much as 130 kg off the weight of its predecessor. This aids performance as well as economy. At 127g/km and a claimed 58.9 mpg, the long-wheelbase 730Ld we're testing is both cleaner and more economical than any car in the original BMW MINI line up. For something well over 5 metres long - the largest car BMW has ever made in fact - that's faintly surreal. On the road the 730Ld manages to conceal its bulk pretty well. The steering is light and quite sharp, giving a reasonable degree of agility, particularly in Sport mode, where well-supressed body roll adds to the illusion. Around town and on twistier rural routes, however, you never quite escape the fact you're driving a limo. Progress is acceptably swift thanks to the 3-litre 265 hp straight six. There's a discrete growl under acceleration, but thereafter all that remains is a faint hint of road noise. Ride by any normal standards is exemplary, but it's not quite the full magic carpet experience; harsher bumps and ridges do still find their way into the cabin. That's despite our test car having the optional Executive Drive Pro package (£2,450), which includes electromechanically adjustable roll bars that relax when the car is travelling in a straight line to improve comfort. The 7-Series has three user-selectable driving modes (Sport, Comfort and Eco Pro) that adjust the steering, suspension and throttle response. Meanwhile, a new Adaptive setting flits seamlessly between the three based on driving style, route data from the sat nav and an optional stereo camera that reads the road ahead. It's a good system that gives the 7-Series a broad range of capabilities, without ever straying too far from its luxury remit. Predictably, there's also a whole host of driver assistance functions. Suitably optioned, the 7-Series can steer itself on the motorway, lock on to the car in front at up to 37 mph in traffic jams and more or less park itself. It can also read speed limit signs, automatically adjusting the radar-guided cruise control if you so wish. For chauffeurs and private hire firms the 7-Series' blend of comfort, quality and surprisingly manageable running costs will no doubt prove irresistible. It also comes with an impressive level of standard kit. The 730Ld starts at £67,700 OTR and BMW claims you'd have to spend around £15,000 on options to bring an S-Class up to the same spec. If there's a downside, it's simply that the 7-Series feels a tiny bit clinical. As accomplished as BMW's flagship model is, it's not unlike a larger, comfier 5-Series; the S-Class arguably has a greater sense of occasion and a more sumptuous interior. Like the cleverest kid at school then, it's not guaranteed to win admirers, but it is one of the best in the world at what it does.